Our customers report increased sales with our unique graphics system. Plus, everything you need to get started. Purchase Backgrounds Individually or as a Set. 1] Select your Digital Backgrounds. 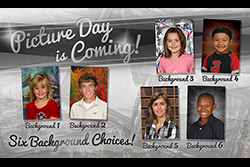 2] Use our Spring Portrait Program Marketing, printable materials to sign up your schools for Spring Portraits. 3] Select your Product Offerings, magnets, bookmarks, memory mates, magazine covers, scrapbook and more. 4] Select your Marketing Materials, posters, flyers and reminders to promote spring portrait day.